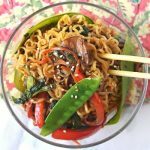 This Teriyaki Veggie Stir Fry is a delicious, inexpensive dinner full of fresh, colorful vegetables. It’s the perfect dinner option when you’re trying to both save money and eat more nutrient-dense foods. My oldest daughter was a vegetarian for seven years. As a result, we’ve discovered a lot of vegetarian dishes that the whole family enjoys. 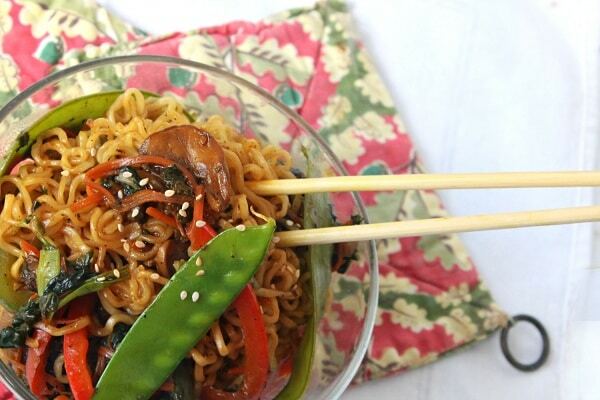 This Teriyaki Veggie Stir Fry is one of our favorites. This dish is really easy to make as it is, but I include a couple of tips below for making it even easier. 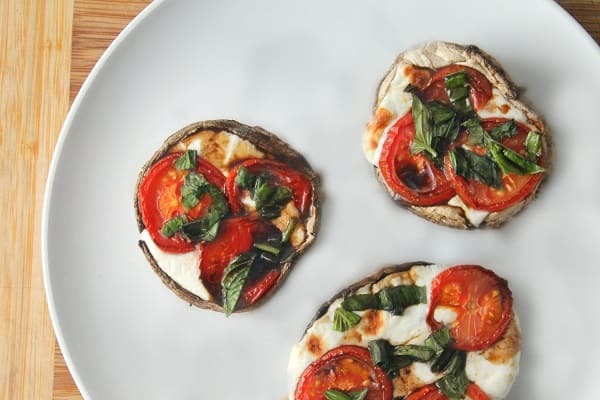 No matter which directions you follow though, you’ll have a satisfying vegetarian dinner on the table in under 15 minutes. First, stir together soy sauce, sugar, rice vinegar, sesame oil and pepper in a small bowl. If you don’t have these ingredients on hand, you can use bottled teriyaki sauce . You’ll need 1/4 cup of the bottled sauce plus another tablespoon. Next, put two packages of Ramen Noodles in a pot of boiling water for 1-2 minutes. Make sure you don’t cook them all the way. You just want them soft enough to separate the noodles. Heat a large frying pan over medium-high heat and then add some cooking oil (I use extra virgin olive oil but you can also use canola oil or vegetable oil). Let the oil heat up for 1-2 minutes. Then add spinach, julienned carrots, sliced bell pepper, sliced mushrooms and minced garlic to the pan and saute for 2-3 minutes. 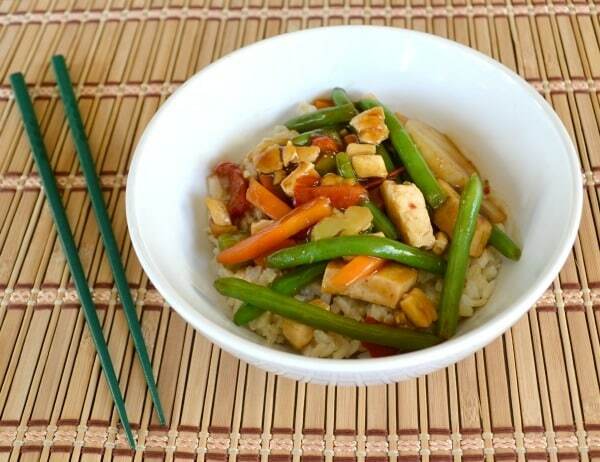 When the vegetables are slightly tender, add the snow peas and green onions and continue cooking for another minute. Want to skip the veggie slicing? 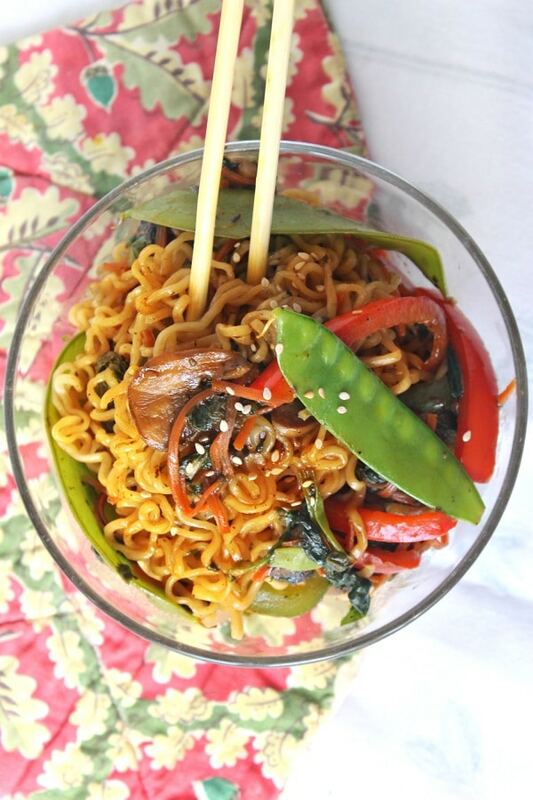 Use a package of your favorite frozen stir fry vegetables instead. Now, add the noodles and sauce and turn up the heat. Cook for a minute or two, until the sauce has thickened and coated the noodles. Serve immediately. In a small bowl combine soy sauce, sugar, rice vinegar, sesame oil, and pepper. Stir and set aside. 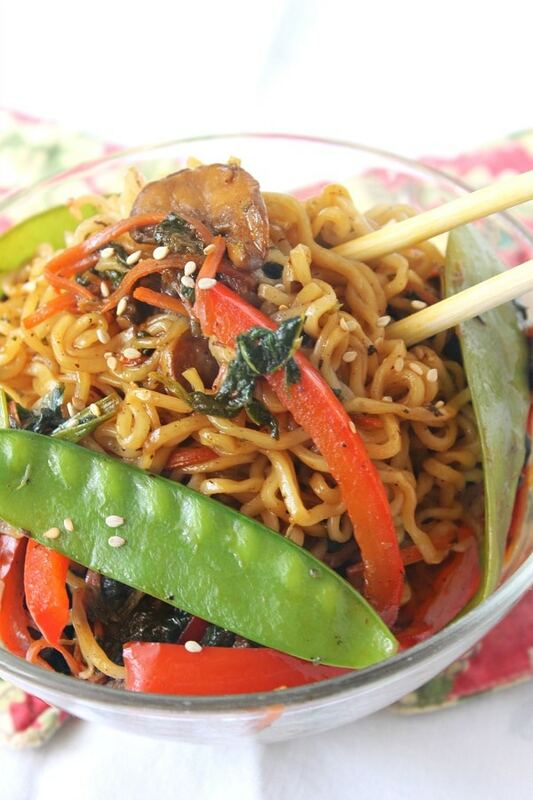 Place noodles into a pot of boiling water and cook just until broken up (don’t cook all the way). Drain and rinse with cold water. Set aside. Heat a large frying pan over medium-high heat. Add 2-3 tablespoons of cooking oil, and allow to heat until it starts to smoke a little. Add in the spinach, carrots, bell pepper, mushrooms, and garlic. Sauté vegetables for 2-3 minutes until slightly tender, stirring constantly. Add snow peas and green onions and sauté for 1 more minute. Add the noodles and the teriyaki sauce. Cook on high heat for 1-2 minutes, stirring constantly (tongs will work best for this). If you notice it sticking to the bottom, add in a little more oil and lower the heat slightly. 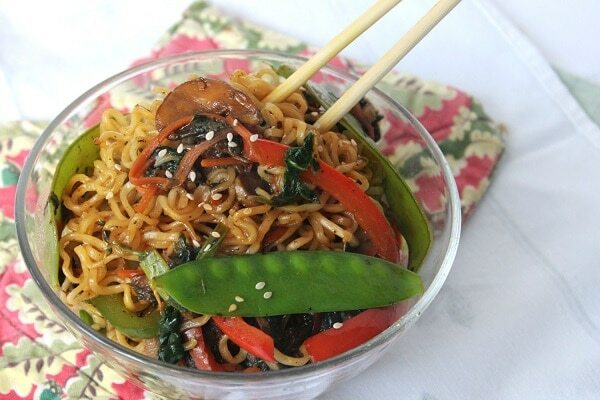 The sauce should be thickened slightly and coating the noodles nicely. Serve immediately. 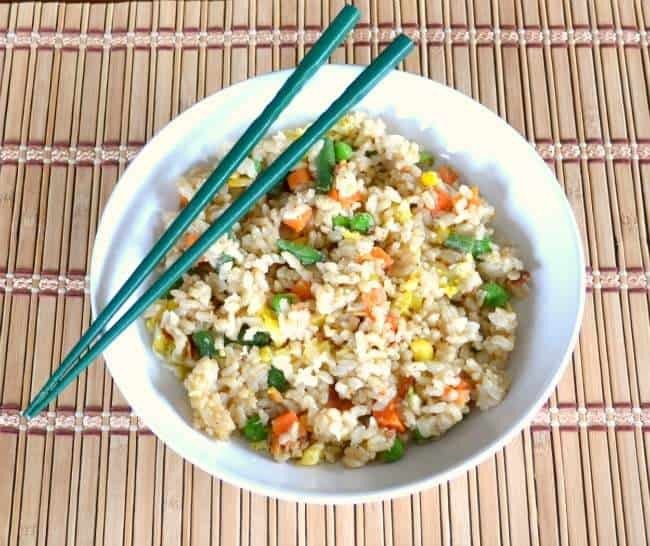 If you liked this Teriyaki Veggie Stir Fry recipe, you might enjoy some of these other easy vegetarian dinner recipes.